If you are considering staying in Thailand and setting up a business then consider what is needed when you register your Thai company. The following are the basics for registering your company in Thailand and what needs to be done in order to get your business in Thailand legal. This is a brief overview so speak to us if you need more information. Following this meeting, the promoters will hand over the business to the directors, who will then call up payment on the shares which, as already discussed, must be a minimum of 25%. The directors then apply for final registration within 3 months of the date of this meeting. It is common practice that a company will specify that only a combination of two or more directors signing together may sign on behalf of the company, or those directors may sign only together with the company seal. What are the company’s Articles of Association (‘Articles’)? A company’s Articles are submitted prior to final registration. They state the basic rules the company must follow after incorporation is completed e.g. frequency of directors’ and shareholders meetings, notice requirements for meetings, numbers needed to pass resolutions at meetings, etc. 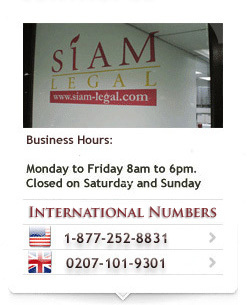 Many companies choose to use Standard Articles at the time of registration (these are basic rules for the company’s operation, usually the minimum to be in compliance with Thai law) and then adopt their own non-standard articles at a later date. This normally ensures acceptance from the MOC official without amendment and has the benefit of usually avoiding any potential delays.